For patients at risk of falling out of bed, it's crucial that a low profiling bed is used as to minimise the risk of injury from falls. 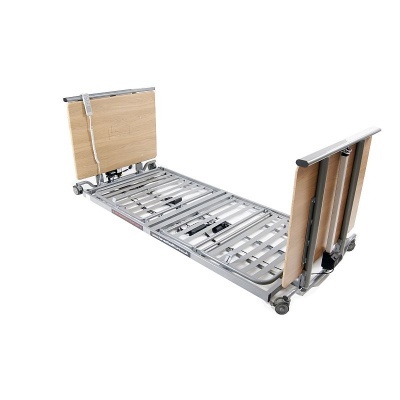 The Harvest Woburn Ultra-Low Profiling Bed is designed with an extremely low profile of just 65mm, reducing the risk of patient injury and providing peace of mind to carers and users alike. The leg rest can be adjusted from 0 to 30 degrees, and the bed has a built in Trendelenburg function, making it highly adaptable. Finally, the base of the bed can be adjusted between 65mm and 640mm, allowing it to adapt to different needs and environments. This profiling bed is unique, as it has recently been updated to lower to just 65mm from floor level. That means that this bed can be used without side rails, almost eliminating risks of patient falls. Should a user roll and fall from bed, at this height impact is greatly reduced and injury is unlikely. These experts will also provide you with crucial advice on how to safely operate your bed so that you can supply the best possible care to your patients. You can add installation using the tick-box at the top of the page.